Tohono O’odham Community College (TOCC) is a two-year college for individuals from all walks of life who want to further their education. TOCC primarily serves the residents of the Tohono O’odham Nation, but anyone pursuing a higher education is welcome to attend. Classes are accredited by the Higher Learning Commission (HLC). 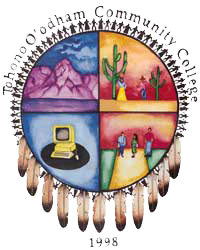 In 2001, the former Tohono O’odham Career Center merged with TOCC. Building and construction trades and other vocational programs are now offered through TOCC’s Department of Occupational Programs, which includes apprenticeships as well as certificate and degree programs. The Tohono O’odham Community College Himdag Committee’s role is to provide advice and education regarding the integration of appropriate Tohono O’odham Himdag at the College. TOCC has a Himdag Policy whereby all regular students and staff learn about the Himdag by studying the Tohono O’odham language, history, and culture. In addition to becoming the Tohono O’odham Nation’s center for higher education and research, TOCC strives to facilitate the preservation of Tohono O’odham culture and tradition. TOCC is preserving the culture by requiring all students in degree programs to study Tohono O’odham language and culture; by starting a program in Tohono O’odham Studies; and by reaching out to people across the Tohono O’odham Nation through community education courses and community engagement programs. This range of activities illustrates the College’s dedication to meeting the educational needs of its community.